Our March 2012 update brings you just the one item this month, but this one is very special, as was mentioned in our introduction. The photo seen on the right comes courtesy of Mici Veit, a relation of Herr Buchschmid. 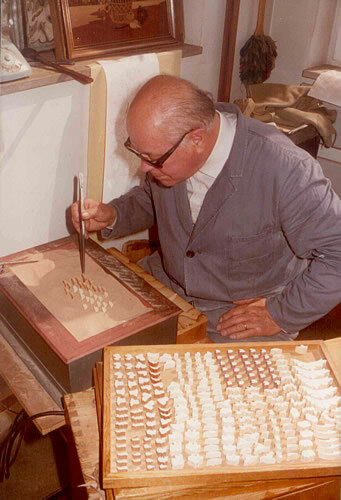 As you can see if you study Mr Buchschmid (for it is no other than he) at work, there is a large tray with small stacks of pieces of precut inlay at his left. He appears to be sorting further precut pieces into their own particular stacks prior to starting the assembly of a another small run of a classic B & G wood inlay picture. Judging from the height of each small stack on the tray, and considering that these veneers are 'packet cut', we would estimate that the production run of this particular title Mr Buchschmid is about to start work on would be around about ten pieces. We think this is a fascinating photo, we hope you enjoy it as much as we do. Thanks once again to Mici for sending it. Click the above button to return to page 36 of "Can You Help"